Searched for a pre-existing topic for this but I hit the year 2009 by the third page, so here you go! I like it. Terracoons weren't my thing and still aren't, but I like it. My favorite thing about it has to be its facial expression. I like it too—it seems a tad overbalanced, but the shading is much nicer (the undertones! ), and it's certainly spunkier. I seem to recall the last revamp going over as rather cutesy and generic; this one does have a bit more personality. This is so much better than the old one. The old one was creepy as hell but the new one reminds me of a giant plush toy. I'm liking everything about the new revamp, especially the legs, except for the face. I think it looks too prankster/street punk now. 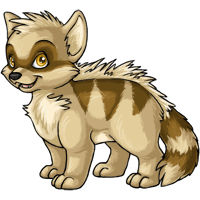 While the expression fits with a raccoon themed pet it doesn't match the old style at all. It is rather amusing to me that I don't like the new attitude when usually I'm complaining about pets looking too cute/nice/generic happy. Go figure.